Waking up at midnight with my baby...and rocking her back to sleep. For as long as I can remember I have wanted to be a mother. I can remember my first dolls; my first high chair; my first pretend crib. All of the cliches about the mother instinct applied to me and my dolls absolutely loved me! At 23 I had a wake up call in the form of a baby. He was perfect...a 10 on the apgar scale. His life was the most (without a doubt) valuable thing I had ever been given in a trust. The truth of a life is that you baby, who you rock to sleep, wake up with and comfort, lay your life down for, your career plans (and your plans for fun) down for...is not yours. The first person to tell you this is usually the child. Vince, the baby I held in my arms and rocked to sleep every night, now works the oil fields in New Mexico, head to toe in protective flame retardant clothing. He loves it. It satisfies the boy who loved to fashion guns out of tree branches, rocks and driftwood. I disallowed guns when he was small- because they were too violent. He loves guns now...and restores them from a defunct state into a thing of beauty. Everything I thought was poison has become his staples...and I have learned to love who he has become. He is the one I have never been able to steer into what I think would be the best choices for him. "After all, mom," (says Mario) "He's his own man". In a week he will be twenty six. Twenty six. My throat is choked, and tears fill my eyes. 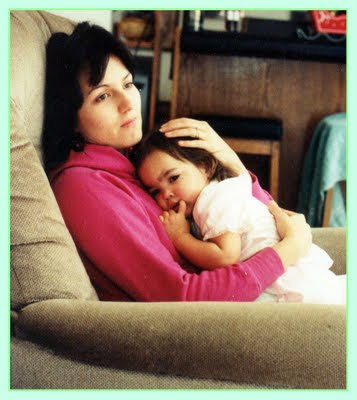 When I was twenty six, I had just given birth to my last child...a daughter. Alicia Robynn... sigh. It took a lifetime of memories to choose her name. Alicia (the name) came from two outstanding women. As a young girl, I decided my daughter would be named after my Nana, Alice Celia - the daring, sharp-as-a-whip woman who dared to stand out and say what she thought.... Later, after marrying Mario I met Alice...his "step mom". Larger than life, a Broadway Song and Dance girl, she sparkled everywhere she went, usually drawing a crowd. Married to Mario's dad, a Spaniard, he nicknamed her "Alicia", his Alice. Robynn, the Christian woman who lived loving Jesus right in front of me and introduced me to Him for real...is her middle name. Now she is a mother herself. To see her mothering instincts is amazing. Today she was speaking of picking out a name for her baby that she is expecting: a girl. Harmony, her own 18 month old daughter could not have been more aptly named. She is a Harmonic force wherever she goes, bringing the least common denominators into a place a peace, love and appreciation of this miracle, this beautiful girl. My goodness, whose genes does she have? Another grandchild is coming in August. The thought of this chills me and excites me. Everyday...a little more growing. Each day, life goes on. I release them to their full destiny in God... My prayers are that they would know how much I love them...and how much they belong in the kingdom of God.